You can download the solution to the following question for free. For further assistance in Economics assignments please check our offerings in Economics assignment solutions. Our subject-matter-experts provide online assignment help to Economics students from across the world and deliver plagiarism free solution with free Turnitin report with every solution. chocolate. Part of the problem they say is supply and demand. There is more consumption of chocolate and cocoa growers cannot keep up. Chocolate comes from cacao trees that grow best near the equator in West Africa where 70% of the world’s supply comes from. Two of the biggest producers include the Ivory Coast and Ghana. A drought and a fungus have decreased production in the region as well. In the past two years, the price of cocoa has jumped 60%. 1. Assume that chocolate operate in a perfectly competitive market, use a well-labelled demand and supply (D-S) model to explain how market equilibrium price of chocolate is being determined. Please clearly explain the calibrating process. 2. Using the D-S model, explain and illustrate what factors have caused the market price for chocolate to rise in the past two years. Clearly explain the calibrating process. 3. What will happen to the market for other confectioneries/sweets as a result of the changes in the market price of chocolate? Make sure to use D-S model to discuss the calibrating process. 4. Do you think the demand for chocolate is price elastic or price inelastic? Explain your answer based on the determinants of price elasticity of demand. Use your answer to discuss the likely impact of the drought on consumers’ total expenditure on chocolate. We assume that the chocolate industry is perfectly competitive. A perfectly competitive market is characterised by a large number of buyers and sellers. The sellers are ‘price-takers’ and equilibrium is determined by the interaction of demand and supply. MC intersects AC(Average Cost) from below. Sellers can earn supernormal profits or incur losses in the short-run equilibria. In the Long-Run, at equilibrium, P=Min point on LAC=LMC=AR=MR, i.e. the firms should earn an only normal profit. 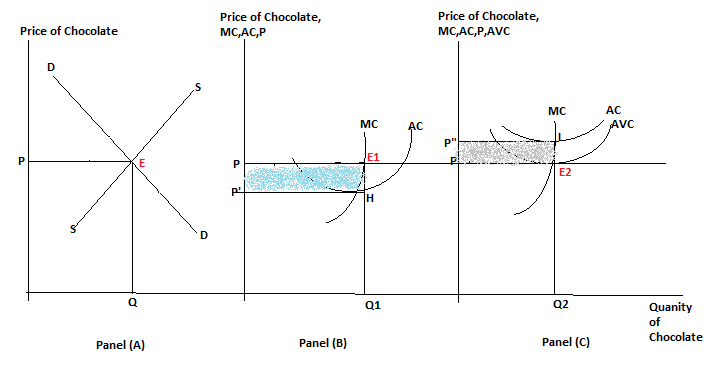 The individual farmers face a perfectly elastic demand curve AR(Average Revenue) (Panels B and C), but the chocolate industry as a whole is a ‘price maker’ thus facing a downward-sloping demand curve as shown in panel (A). In Panel (B), P>minimum point on AC and thus the cocoa farmer makes a supernormal profit. So, this is short-run equilibrium ‘H’ but not long-run equilibrium as then farmers will only earn normal profit. To take a share of this supernormal profit, other farmers enter the cocoa industry. This shifts the market supply curve (which is the positively sloped part of the MC curve above the minimum point of the AVC(Average Variable Cost) Curve of chocolate to the right (D K Sethi, 2014), thus pulling up price to P from the initial P’, whereby the farmers earn normal profit and reach long-run equilibrium. See Panel (A). In Panel (C), P<minimum point on AC. Thus, the cocoa farmer incurs losses as average costs exceed the price, and even this is not a situation of long-run equilibrium. As production is reduced, the market supply curve shifts leftward, pushing down Price of chocolates to P, thus reaching long-run equilibrium as illustrated in Panel (A)……….